Padded saddle, Plains, North America. Pitt Rivers Museum, cat. #1884.51.14. Image courtesy of the Pitt Rivers Museum. At our Oxford workshop in May 2015, Object Lives participants worked with this stunning saddle. We know very little about its history, although we can tell from the style of porcupine quillwork that it is from the northern Plains and likely dates to the first half of the 19th century. We were particularly interested in a dress identified by Kate Reed (Hayter Reed’s granddaughter) as having belonged to the wife of Kainai leader and Treaty Chief Red Crow. A list of items sent by the DIA to the World’s Fair, and included among the Hayter Reed papers at the McCord, seems to support this attribution: it mentions a dress “From Mrs. Red Crow”. A closer look into the documents, however, suggested a different picture. I chose to look at two dolls, M976.102.13 and M976.102.14, at the McCord Museum workshop. Each was sewn by hand with cloth bodies and clothing, leather boots, and fur trim and beadwork. One has an interesting beaded disk on his parka. These dolls were made at the Parc Savard Hospital in Quebec City, sometime in the mid-1950s, part of a larger collection donated to the museum by Dr. Walter Pfeiffer. The Object Lives group examining a Nitsitapi embroidered hide dress, from the Hayter Reed collection, with the assistance of Guislaine Lemay. The “Object Lives” research group re-assembled in Montreal in early May 2016. Our hosts were two of our institutional partners in this project: the McCord Museum and the Gail and Stephen A. Jarislowsky Institute for Studies in Canadian Art. This spectacular pouch (M740) combines a European cotton textile with a re-purposed trade silver armband, which is punched so that thin hide thongs can be threaded through and then netted. The hide netting is wrapped in porcupine quills instead of being knotted. The Thunderbird being it represents still looks out powerfully, two centuries after it was carried by one of Chief Tecumseh’s men in the War of 1812. As we continue to think about the hide banyan (PRM 1906.83.1) and its changing, complex cross-cultural meanings and histories, we have also continued to wonder how we might learn more about this intriguing garment. At PRM, Laura Peers commissioned Charlotte Linton (a textile designer and student in the Visual, Material and Museum Anthropology course) to make an actual sewing pattern from the garment. Front view of the PRM Dew Claw Bag 1954.9.22. Image courtesy of the Pitt Rivers Museum. We held an interpretive discussion of the dew claw bag (1954.9.22) at the Pitt Rivers Museum on April 13, 2015. Though not much is known about the bag, it is most likely associated with the people of the Great Lakes in the United States. 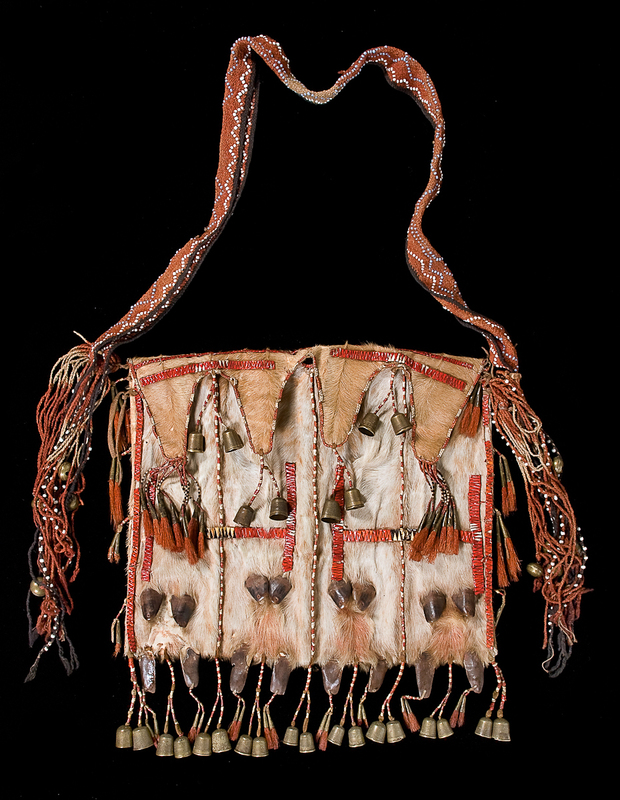 It was part of the collection of Harry Geoffrey Beasley (and his wife Irene Marguerite Beasley) who donated the bag to the Pitt Rivers Museum. 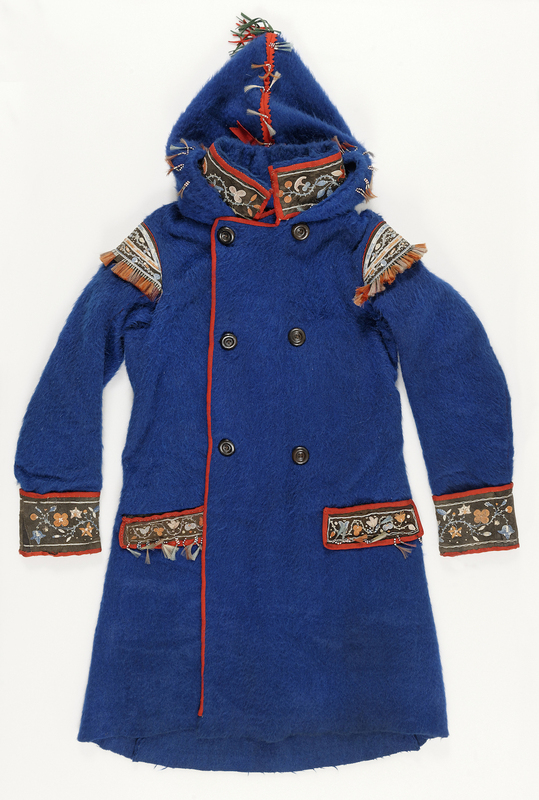 Front view of the Pitt Rivers Museum Metis Coat, 1951.2.19. Image courtesy of the Pitt Rivers Museum. Greeted with much enthusiasm and quickly dubbed Mr. Magnificent, the Metis Coat 1951.2.19 sparked a great deal of discussion and debate during the workshop. PRM 1896.21.1.2. Image courtesy of the Pitt Rivers Museum. Study of the Tollemache ensemble is a great opportunity to learn more about Wendat 19th- century commercial and diplomatic traditions and the connections and overlaps between the objects produced for these two purposes. PRM 1954.9.26. Image courtesy of the Pitt Rivers Museum. With an interest in the relationship between a number of indigenous groups and the animals they lived and travelled with, it makes sense to take a look at surviving objects that adorned the dogs of Canada’s northwest. The Pitt Rivers Museum Long Hide Coat, 1906.83.1. Photograph provided by the Pitt Rivers Museum. 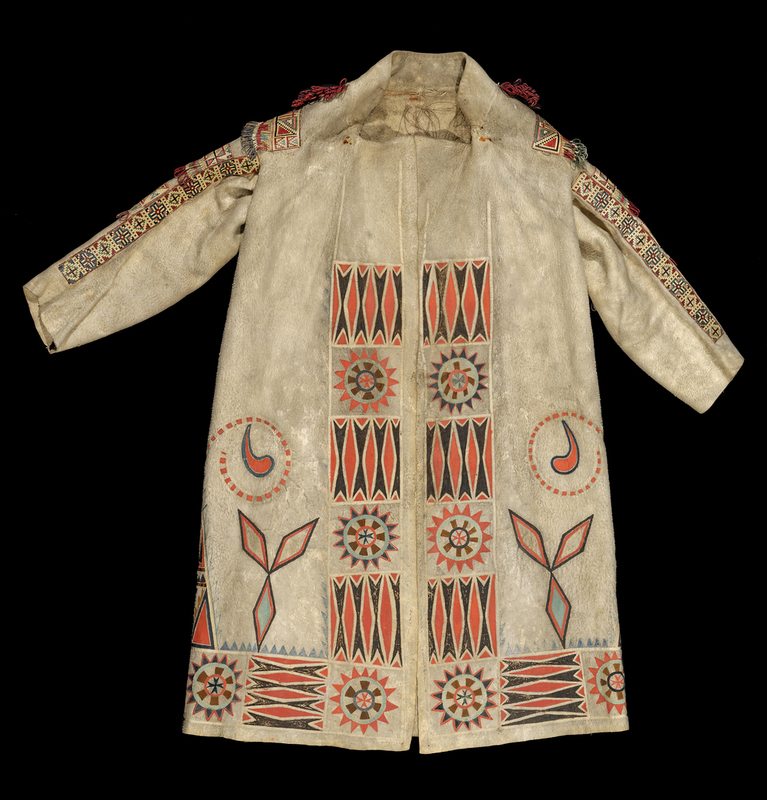 One of the fascinating objects we are exploring for ‘Object Lives’ is a long coat, made of moose hide or caribou hide, at the Pitt Rivers Museum. As a researcher specializing in Icelandic-Canadian material culture, walking through the Arctic peoples installation at the Pitt Rivers Museum generated a sense of familiarity. Behind the glass evidence of numerous northern communities, including carefully crafted pieces of clothing, art and technology, spoke to the many populations- and seamstresses that have strived to make life and labour possible in very challenging landscapes. I am working with a beaded belt, also known as 1938.36.1715. The belt is loom-woven of grey thread and seed beads to make a slim band with a repeating pattern of purple and yellow pointed-figures and diamonds on a black background. I measured the object, counted the beads, read the tag, and took photographs. As I worked, I thought about how the object traveled from Minnesota, across the ocean to Oxford, to become part of the Pitt Rivers Museum collections. This saddlebag is highly unusual, and to my knowledge no other example has come forward in the research to date. Objects record the intentions of past generations. Our aim was to uncover and assess the evidence held in selected artifacts in the collection of the Pitt Rivers Museum, Oxford University. Objects record the intentions of past generations. Our aim was to uncover and assess the evidence held in selected artifacts in the collection of the Pitt Rivers Museum, Oxford University. The PRM holds particularly rich collections and some of the earliest materials from the colonial era of Northern North America and from the periods that followed. Our research team selected items that reveal the sequence of contacts and connections among Indigenous peoples, as well as between Indigenous and Métis peoples and European traders and settlers (c. 1700s-1800s) in regions of what is now Canada. We also selected several 20th century objects central to our project. Most of these objects reflect métissage, the blending and mixing of cultures and peoples, revealed in the hybridity of things. This creative mixing typified many facets of material culture in Northern North America. Clothing, in particular, was an active agent in cultural contact and change, deployed with great intentionality by Indigenous, Métis and European peoples in these northern regions. The agency of objects is revealed in the cut, stitching, decoration and signs of use. The ‘Object Lives’ group encountered their first group of objects at the PRM in April 2015. Our aim was to uncover the features and dynamics of these objects and their contributions to material life. We engaged with each object collaboratively and discursively. The following pages reflect the Discovery Process; the blogs produced by team members suggest the stages of knowledge developed in this manner.